Prime Minister Tony Blair has unveiled the government's plan to transform London for the 2012 Olympics. The package includes £35m to boost employment and skills, more affordable housing, at least 60 new city academies and more NHS walk-in centres. 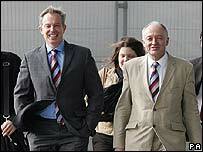 Mr Blair said he wanted the Olympics to act as a catalyst to delivering long-lasting change to London. "As of today, we are all competing for London and 2012," he said launching the blueprint for action in central London. He said preparing London to host the "greatest show on earth" would require the collective efforts of all Londoners. He said government at every level, business, the voluntary sector and citizens must work together to rise to the challenge ahead. "We have six years to regenerate east London," he said. "Six years to demonstrate to the world, as to ourselves, that we can host what will be, I am absolutely confident, the greatest show on earth." He said the task was to harness the "optimism" of 6 July, the day London won the Games, with the "steadfast determination" of 7 July, when London came under attack, to create a lasting legacy. Mayor Ken Livingstone, who was at the launch at City Hall, said: "I do not have the slightest doubt in saying that for London the best is yet to come."